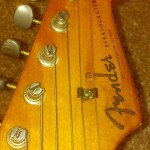 Today I just got in a 1959 Fender Stratocaster for a setup and overall assessment of it’s originality. This beauty was made during a transition period where Fender went from a 1-piece maple neck to a slab rosewood fingerboard and a 3-ply pickguard. This particular one is a little more rare with it’s 10 hole 1-ply pickguard. At first glance it appears to be 100% original but I need to take things apart and get a closer look. 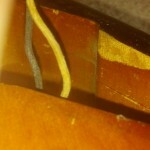 Removing the neck shows matching lacquer chips on the heel of the neck and the bottom of the neck pocket which tells me the neck is original to the body. 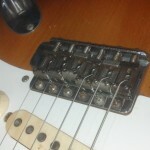 The vintage tremolo is complete with original saddles and screws. 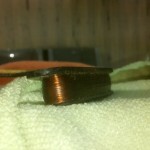 Some of the saddle height screws and springs have been replaced which is common because they can corrode beyond repair over time. These are minor things and have very little affect on the value and originality. 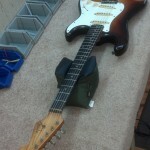 The neck is all original with the original frets, nut, and Kluson machine heads. Someone drilled a small hole through the headstock and filled it at some point. Luckily it’s very non-intrusive and doesn’t look very bad. Maybe a string tree? Who knows, this guitar has been around for longer than me so there is no telling what exactly happened there. 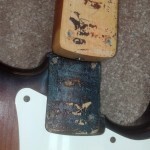 When I first removed the pickguard, I noticed a filed edge on the control cavity route. Then it hit me, they did this in the factory so that the shield plate would sit down into the cavity. 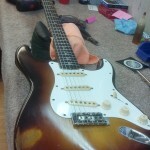 This body was routed for the 3-ply 11 hole (which they transitioned to during this year) but they installed a 1-ply 10 hole pickguard instead and had to modify the body to fit. There was no exact science back then. All of the solder joints were original as were the pickups, pots, switch, capacitor, and jack. The Stackpole pots all had the same numbers 304920 which dates them in the 20th week of 1959. So far everything checks out to be completely original. 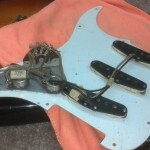 Now I am carefully removing the pickups to check for rewinds and to replace the pickup height tubing. The original tubing is compressed and hardened so badly I can’t adjust the pickup height. Each pickup checks out to be the original 1959 handwound pickup with neck(5.63k), middle(6.17k), and bridge(5.73k). Time to put everything back together and setup the guitar. This 1959 strat is in overall good condition and sounds incredible. The frets and pretty worn, but they still play great. Overall I’m really glad to see such a great piece of history that has made it to this point in time without being destroyed or modified. Oh well, I guess its time to move on to the next guitar and send this one back home where it belongs. Thanks for viewing and check back again soon for more cool stuff!